What Skills Are Needed For FinTech Job? IT jobs are in high demand among unemployed workers or college graduates, as well as qualified candidates are in short supply for most positions within the industry. Fintech, however, takes that to another level. As a booming industry that is continually changing legacy institutions by disruption and the rapid pace of evolution, financial technologies need people to fuel the progress. The interest in the industry is at its highest at the moment, and there is little surprise that many people want to land a job offer in this sphere. Whether one is aiming solely at monetary benefits (which is fine), wants to join the process of shaping the future of finances or find a spot to reach the maximum personal development score - fintech is a fine place to start looking for a vacant position. 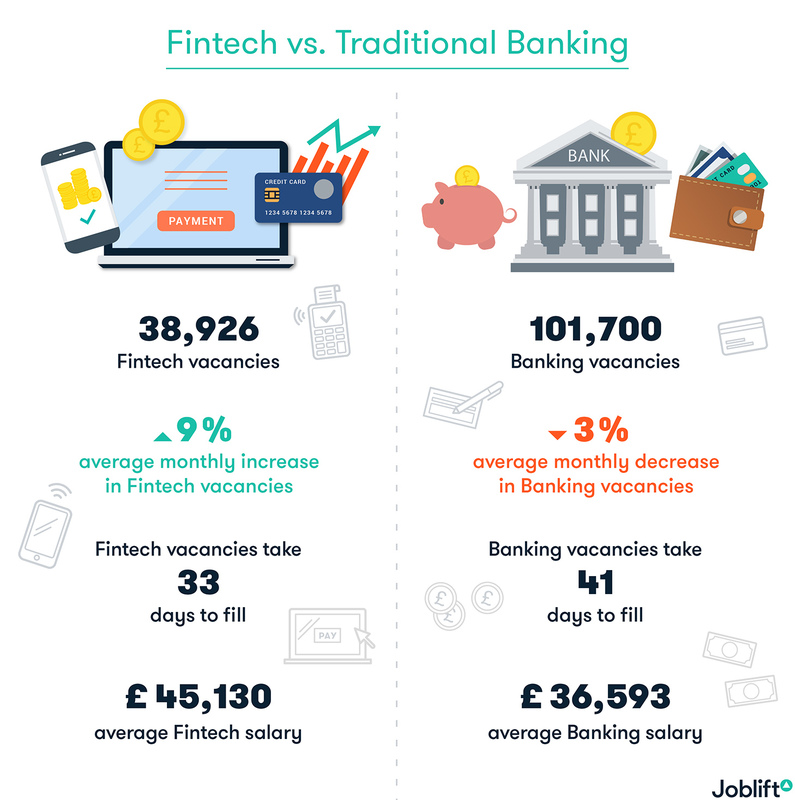 Here’s how Joblift visualizes the positive dynamic of UK’s fintech job market (alongside some salary numbers) in comparison to traditional banking positions. The monetary benefits seem obvious. And the thought of possibly changing the future technology is somewhat romantic as well. It's time to divide the job market into segments and explain what exactly the industry needs at the moment. It won't be a surprise to find out that the industry that's driving innovation in the financial segment will require a lot of talent with solid hard skills. Programmers, designers, hardware engineers and more - there's a lot of room for activity. 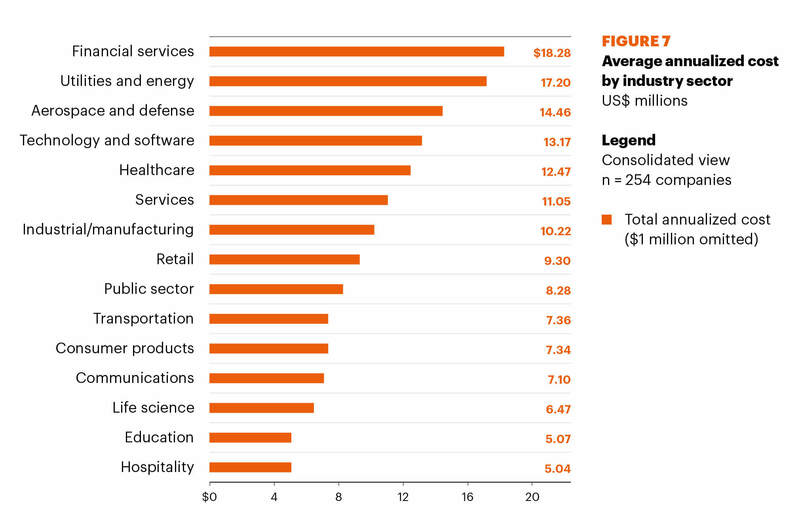 The list can shrink or grow depending on the region, company and its activity sphere, but you get the general picture. Based on your skill and experience, you can land a job that would guarantee anything from $80,000 to $100,000 a year and beyond, when taking the US market into account. If you’re new to programming and have mastered front-end development, your services will be required. If you are skilled enough for more complex issues, fintech is full of platforms that need to be maintained and APIs to create. Fintech has accelerated the means to acquire, analyze and utilize the data from countless sources. Artificial intelligence helps to navigate and find the required information, allowing a more comfortable life for data scientists. However, they must know how to operate and train the AI. Fintech is ready to pay around 25% more for data science experts than other industries, which makes it an excellent choice with those knowledgeable about AIs and training patterns. The cost-effectiveness trends demand a better conversion of acquired data. Petabytes of information must be thoroughly examined to provide a unique user experience for each customer, thus increasing ROI. The specialist would have to be proficient at data science toolkits and visualization tools, alongside query languages and NoSQL databases. Each position will demand their own unique set of skills, but the general picture outlines precisely these requirements. The original idea of fintech was to deliver better results for less time while cutting costs and offering unique value to the client. All that had to come from new technology. But as each business model can be improved, so can be the technology. Automation engineers will need to tackle the core of the company and find ways to make it work faster and comply with the original requirements we mentioned in the previous paragraph. Some positions may combine automation with AI, Deep Learning and Machine Learning, taking it solely to the data analysis niche. Regardless, an employee that knows how to make the processes more efficient and consume fewer resources, would be an invaluable addition to any team. This skill (although it is nearly impossible to specify the technologies or qualifications that are common or general) is the door to institutions like startups and government facilities at the same time. A study by Accenture shows that financial organizations are the ones to suffer the most from cybercrime, with total costs sitting at $18 million for 2017. The damage dealt to other industries by cybercriminals is equally staggering, meaning that a cybersecurity expert can easily expect to find a job in any of the spheres mentioned above. Probably the talk of the decade, blockchain is discussed by countless experts, yet much fewer can make it work for the particular environment. An expert with blockchain knowledge will be asked to build platforms for money transfer (both crypto and fiat), smart contracts, advanced data management and so forth. A skilled blockchain developer can secure a deal that pays from $100,000 to $250,000 annually, although we were unable to find a solid proof for the latter figure. Openness. As a manager, you have to be as open with other employees as possible. As a developer or engineer, the same thing is always preferable. An open person can communicate better, seek assistance faster and thus deal with problems far more efficiently than a guy who likes to do everything by himself. Problem-solving. An employee solves a ton of issues on a daily basis, one may say. This concept, however, circulates the mentality. An employee must be proactive and seek opportunities to improve on existing results. Quick thinking is a crucial part of problem-solving, as it allows no time for hesitation or panic - only determination and cold analysis of the destination. Communication. A derivative of openness. It means how well the person integrates with the team both on and off the actual working process. Communication allows more efficient collaboration of the departments and teams, thus granting bigger benefits at the end. It is imperative to build strong bonds within the team, so each employee is ready to take on any challenge for themselves and for "that guy next to them." Transparency throughout the organization. A concept that applies more towards managerial staff. The age of startups made traditional management obsolete. Nobody will appreciate secrecy, or worse treatment just based on position. Today's mentality is about CEOs being equal to junior developers on a human level. When managers are openly discussing casual stuff or project details with everyone else despite their position, it creates a bond within the team that is highly beneficial for the company. Adaptability. The atmosphere and workflow of a startup inevitably mean issues that one will need to tackle regardless of their skill or position. Versatility and ability to adapt is critical for an employee to move further up the career ladder within startups or other highly digital environments.